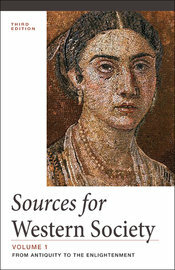 Sources for Western Society provides a variety of primary sources to accompany A History of Western Society, Eleventh Edition and the new Value edition of A History of Western Society. With over fifty new selections—including a dozen new visual sources—and enhanced pedagogy throughout, students are given the tools to engage critically with canonical and lesser known sources, and prominent and ordinary voices. Each chapter includes a "Sources in Conversation" feature that presents differing views on key topics. This companion reader is an exceptional value for students and offers plenty of assignment options for instructors. Sources for Western Society is free when packaged with A History of Western Society and is heavily discounted when packaged with A History of Western Society, Value Edition.